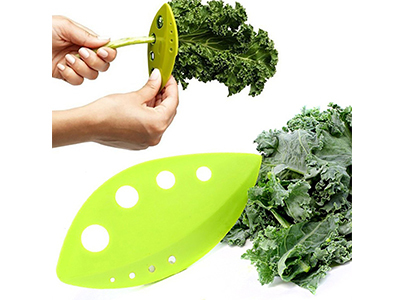 ♦Strip kale, collards, chard and herb leaves from stems in seconds with this beautifully simple kitchen tool. This Herb Stripper Great for prepping kale, Swiss chard and collards, this compact, handy tool easily removes the tough central ribs from these healthy, nutrient-packed greens. With small holes for stripping herbs such as rosemary, oregano and thyme, the speeds up time-consuming prep tasks and makes a versatile addition to any kitchen. You can also strip loose-leaf herbs such as peppermint, parsley and basil. 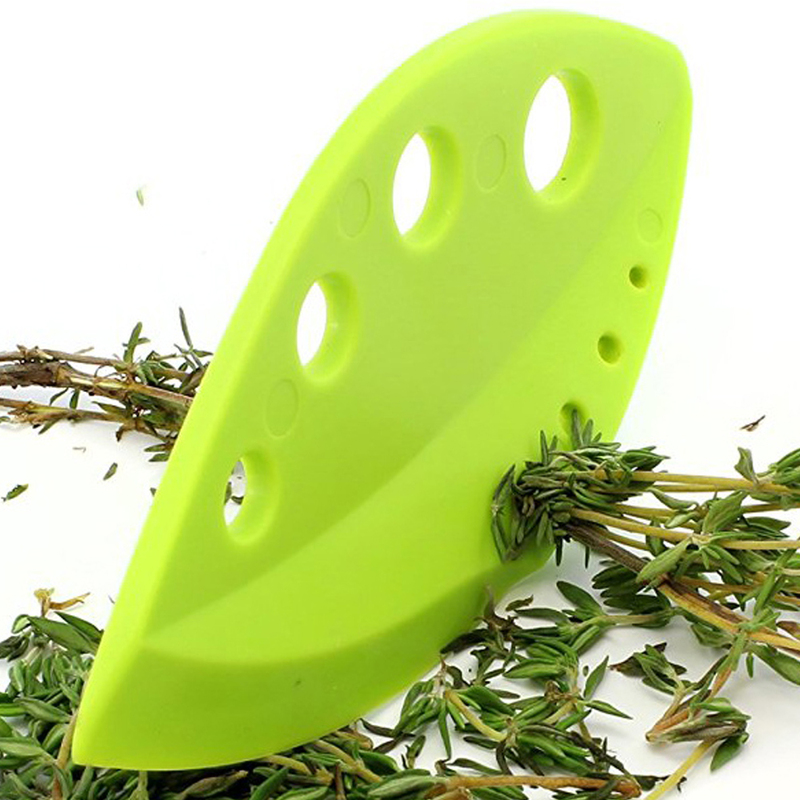 This leaf-shaped kitchen tool works best with woody herbs like oregano, rosemary, thyme, tarragon and is perfect for making kale chips and other healthy snacks as well as some loose-leaf herbs such as peppermint, parsley and basil take the work out of stripping herbs. Each one into 1 pp bag. then packing 1 color carton. Strip kale, collards, chard and herb leaves from stems in seconds with this beautifully simple kitchen tool. You can also strip loose-leaf herbs such as peppermint, parsley and basil. 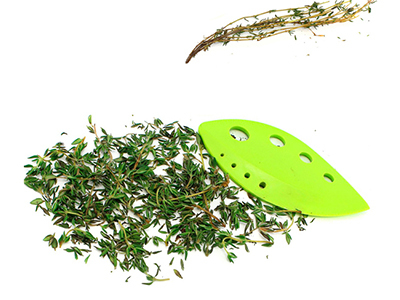 This leaf-shaped kitchen tool works best with woody herbs like oregano, rosemary, thyme, tarragon and is perfect for making kale chips and other healthy snacks as well as some loose-leaf herbs such as peppermint, parsley and basil take the work out of stripping herbs. Just place the stem through your desired hole. This leaf-shaped device works well with woody herbs like oregano, rosemary, thyme, tarragon, parsley, cilantro and is perfect for making kale, collard greens chip and other healthy snacks. It also works well with some loose-leaf herbs such as peppermint, parsley and basil. 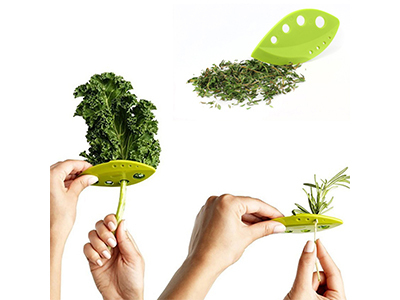 The herb stripper will help you remove kale, chard and leaves from herb stems fast, easily and efficiently so as to offer you and your family the delight to taste savory dishes and fresh, aromatic salads. 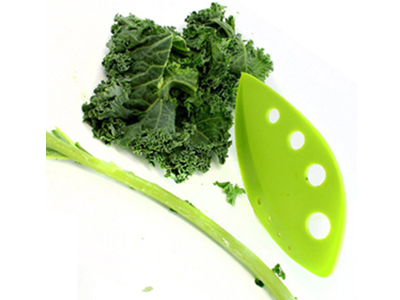 Strip kale, collards, chard and herb leaves from stems in seconds with this simple kitchen tool. The hand held design is easy to use, just insert the stem and pull through the hole. Please note to choose the hole which is smaller than the herb to make it work better. The stripping tool works in a simple way making it great fun to use as you simple place your herb in the appropriate notch and then you just pull. Your children will love it and bet they will find excuses to be in the kitchen. From now on herb prepping will be your favorite cooking task and you will eagerly add that little rosemary here, and that little fresh basil there, reaching the full of your cooking abilities’ potential. Herbs and greens, if cut by knife, lose a lot of their valuable nutrients. Moreover, you may throw away good and edible parts of your herb just because your knife went a little further. Preserve your herb’s nutritious substances and let the knife cut the meat. Until now, herbs needed some time in order to be washed, cut and processed. That can be changed. A little pull takes the place of the tedious and boresome task of hand stripping.